It seemed Ireland are capable to secure a vital win in their World Cup qualifier against Republic of Ireland in Dublin, as they came from behind to lead 2-1 by courtesy of brace from Walters. 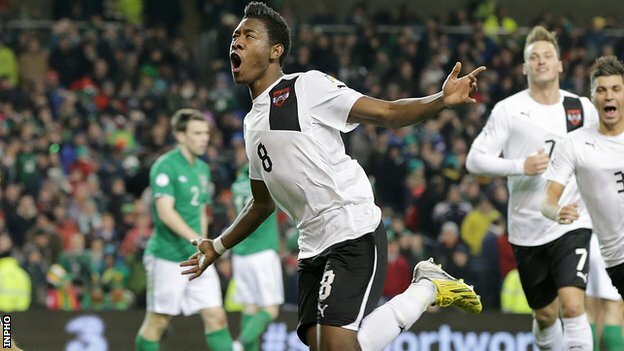 However David Alaba’s deflected shot in the dying stages of the game helped Austria to earn a 2-2 draw. Martin Harnik opened the scoring with a simple finish from Junuzovic’s pass after the horrendous defensive mistake by Ciaran Clark in the 12th minute of the game. However 13 minutes later Republic of Ireland leveled the scoring through Walters’ penalty awarded for a foul on Long. Walters put the home side ahead right before the half-time whistle with a headers from Whelan’s free-kick. However Alaba sent Austria fans into raptures by scoring an equalizer in the added time with a strike from 20 yards. Republic of Ireland are currently lying in the fourth place, level on points with third-placed Austria, who are outstripping their table neighbors on goals difference.